The judges of the International Criminal Court, sitting in a plenary session, elected Nigerian Judge Chile Eboe-Osuji as President of the Court for a three-year term with immediate effect. The election took place on Sunday, March 11, 2018, according to the information made available on the ICC website. In his acceptance speech, Eboe-Osuji said, “I am deeply honoured to have been elected by my peers as President of the International Criminal Court. “As I take up my duties, I feel encouraged that I am able to rely on the wide experience of the two Vice-Presidents, Judge Robert Fremr and Judge Marc Perrin de Brichambaut, both of whom I have closely worked with previously. “I look forward to working together with them as well as with all the judges, all the officials and the staff of the Court in a spirit of collegiality. 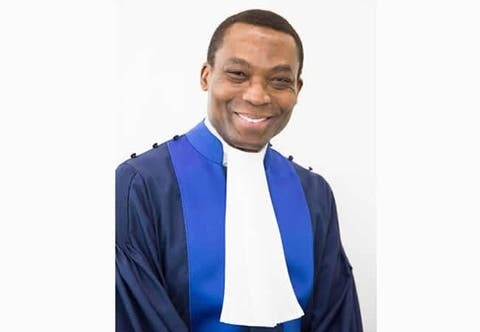 According to Wikipedia entry on him, Chile Eboe-Osuji was born in 1962 and he had served as a judge of the International Criminal Court, The Hague, having been elected on December 16, 2011 and sworn in on March 9, 2012. He was also said to have served as a Legal Advisor to the United Nations High Commissioner for Human Rights. Eboe-Osuji was called to the Nigerian Bar in 1986 and practised briefly in the country. After obtaining his master of laws degree from McGill in 1991, he worked as a barrister in Canada, having been called to the Bar in Ontario and in British Columbia in 1993. From 1997 to 2005, Eboe-Osuji worked at the International Criminal Tribunal for Rwanda as prosecution counsel and senior legal officer to the judges of the tribunal. From 2005 to 2007, he worked in Canada as a barrister and law lecturer. Working for the Special Court for Sierra Leone as senior prosecution appeals counsel in 2007/08 and returning to the ICTR from 2008 to 2010 as Head of Chambers, he became the Legal Advisor to the United Nations High Commissioner for Human Rights Navi Pillay in 2010, and held a cross-appointment as the principal prosecution appeals counsel at the Special Court for Sierra Leone, in the case of Charles Taylor, the former President of Liberia.